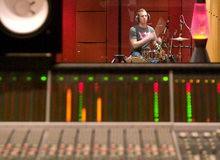 In this new installment I will suggest some mics and DIs to record electric guitar. By no means is this list meant to be an exhaustive one. As usual, I will stick to the standard solutions which have proved their worth through the years, so the least experienced among you know how you can go safe. I'll begin with the dynamic mics. As you probably guessed, the standard among standards is the indestructible Shure SM57. It would be useless to try to count the ever-growing number of albums or electric guitars that have been recorded with this jewel with an unbeatable value for money. If you don't have one yet, maybe it's about time you get your hands on one! Another go-to option is the Sennheiser MD421. With a wider frequency response than the SM57, the MD421 allows you to get a richer bass and high end, plus being capable of handling higher SPLs. The only con is that it's mic clamp is somewhat fragile. Next is my all-time favorite, the Electro-Voice RE20. Granted, it's much more expensive than the previous two but, in my humble opinion, it's the best way to when it comes to recording a guitar amp. Capable of handling anything you throw at it, this Rolls Royce of dynamic mics features an extremely wide and flat frequency response. What's more, the RE20 almost doesn't have any proximity effect. What else could you ask for? To finish with the dynamic mics I picked the Sennheiser e609 which was especially conceived to record guitar amps. Very popular on stage, this mic often gets the cold shoulder in the studio. However it does have one advantage that makes it stand out from the rest: its supercardioid polar pattern. Onstage this allows you to forget about any bleed on the guitar mic, while in a home studio it might come in very handy when the acoustics of your room are very intrusive. Moreover, the e609 doesn't necessarily need a mic stand because it can be suspended in front of the mic with an XLR cable. In my opinion, all of this make it a good choice when recording guitar amps in a home studio. Ribbon microphones are often shun by beginners when it comes to recording an electric guitar, most probably due to the fragility of such mics… And yet, certain models are responsible for some of the most legendary guitar sounds, like the Beyerdynamic M160 who was used by none other than Hendrix and Led Zeppelin! The Royer Labs R-121 is no stranger to the topic either, but unfortunately its price makes it a choice reserved to only those with big pockets. I'll finish this selection with a couple of condenser mics. 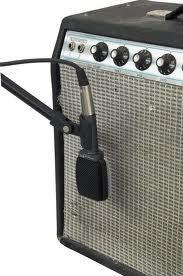 Once again, the famous AKG C414 is a standard choice when it comes to recording electric guitar. Its sensibility, coupled with a wide frequency response, produce a "rich" sound without being "aggressive." Plus, its slight boost above 3 kHz is ideal to add some presence to the sound and hence to make it stand out even in the busiest parts of a song. The most fortunate among you will certainly prefer the legendary Neumann U87 whose list of users reads like a who is who of rock: AC/DC, Pink Floyd, Bruce Springsteen, etc. Bizarrely enough, while the guitar is one of my favorite instruments, I'm not very fond of using DIs when it comes to a "normal" recording. I actually believe that the instrument inputs available on almost any audio interface nowadays ought to be more than enough for anyone starting out. But if you are more adventurous and/or have some money to invest on a DI, I would encourage you to get a good DI for bass guitar. First because I think a Di is way more important and useful for a bass and, second, because a good DI for bass will also work fine with a six-string guitar.